In 2009 over 300 US soldiers died because of this lie. How many will die in 2010? Six more Americans were reported killed in fighting in the south – three Thursday and three Friday – pushing the U.S. death toll for July to a record 66 and surpassing June as the deadliest month for U.S. forces in the nearly nine-year war. U.S. officials confirmed the latest American deaths Friday but gave no further details. Five of the latest reported deaths were a result of hidden bombs – the insurgents’ weapon of choice – and the sixth to an armed attack, NATO said in statements. U.S. commanders say American casualties are mounting because more troops are fighting – and the Taliban are stiffening resistance as NATO and Afghan forces challenge the insurgents in areas they can’t afford to give up without a fight. The month has brought a sharp increase in the tragic images of war – medics frantically seeking to stop the bleeding of a soldier who lost his leg in a bombing, fearful comrades huddled around a wounded trooper fighting for his life, the solemn scenes at Dover Air Force Bare in Delaware when shattered relatives come to receive the bodies of their loved ones. After a dip in American deaths last spring following the February capture of the southern town of Marjah, U.S. fatalities have been rising – from 19 in April to 34 in May to 60 in June. Last month’s deaths for the entire NATO-led force reached a record 104, including the 60 Americans. This month’s coalition death count stands at 89, including the 66 Americans. Some U.S. military officers speculated that the spring drop in fatalities was due in part to the fact that many Taliban fighters in the south – the main focus of NATO operations – were busy harvesting the annual opium poppy crop, a major source of funding for the insurgents. As the harvest ended and the pace of battle accelerated, more American troops were streaming into the country as part of President Barack Obama’s decision last December to dispatch 30,000 reinforcements in a bid to turn back a resurgent Taliban. American troop strength stands at about 95,000, and by the end of August the figure is expected to swell to 100,000 – three times the number in early 2009. Commanders say more boots on the ground inevitably means more casualties. With the additional troops, U.S. commanders have been stepping up the fight against the insurgents in their longtime strongholds such as the Arghandab Valley, Panjwaii and Zhari – all on the outskirts of Kandahar city, the biggest urban area in the ethnic Pashtun south. The rise in casualties is likely to erode support for the war in Washington and the capitals of the 45 other countries that provide troops – especially if NATO commanders are unable to show progress in curbing the Taliban. The Dutch are due to remove the last of their 1,600-member force at the end of this month, and Canada plans to remove its 2,700 troops next year. 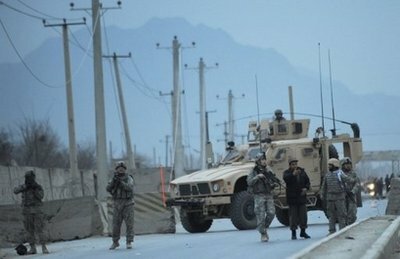 In the capital, Kabul, police fired weapons into the air Friday to disperse a crowd of angry Afghans who shouted “Death to America!”, hurled stones and set fire to two vehicles after an SUV, driven by U.S. contract employees, was involved in a traffic accident that killed four Afghans, according to the capital’s criminal investigations chief, Abdul Ghaafar Sayedzada. Associated Press Writer Amir Shah in Kabul and AP researcher Monika Mathur in New York contributed to this report.